Writer/director Jane Campion's third feature unearthed emotional undercurrents and churning intensity in the story of a mute woman's rebellion in the recently colonized New Zealand wilderness of Victorian times. The Piano is a 1993 film about a mute female pianist and her daughter, set during the mid-19th century in a rainy, muddy frontier New Zealand backwater. The film was written and directed by Jane Campion, and stars Holly Hunter, Harvey Keitel, Sam Neill and Anna Paquin. 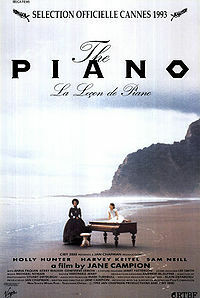 It features a score for the piano by Michael Nyman which became a bestselling soundtrack album. Hunter played her own piano pieces for the film, and also served as sign language teacher for Paquin, earning herself three different screen credits. The film was an international co-production by Australian producer Jan Chapman with the French company Ciby 2000. Alistair Fox has argued that The Piano was significantly influenced by Jane Mander's The Story of a New Zealand River.